Like it or not, the Prius family is growing. In addition to the popular and successful standard Prius, now referred to as the Prius liftback, Toyota has introduced the larger, family-orientated Prius V; the ultimate high-mileage king; the Prius Plug-in; and earlier this year introduced the babyback Prius itself: the Prius C.
So what exactly does that “C” stand for? Could it be cute, cuddly… conservative? Thankfully it’s none of the above. 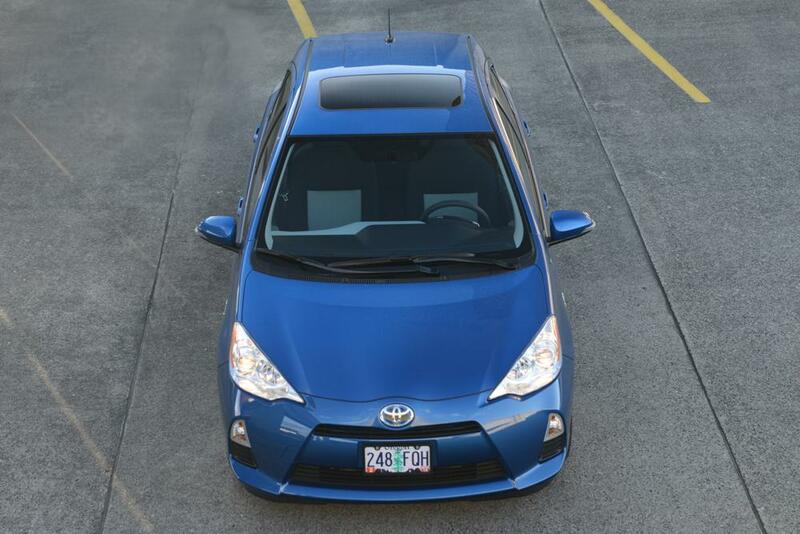 The “C” stands for city, and that’s exactly where Toyota feels like the Prius C will be most at home. And we have to agree. The family of Prii (that’s the plural of Prius, according to Toyota) shares a lot of commonfeatures, and design language happens to be one of them. But like any younger sibling the Prius C yearns for its own identity, which it manages to exhibit thanks to a front fascia that distinctly marks it as a member of a Prius family, while being unique enough to distinguish it among its hybrid brethren. Toyota has clearly made some effort to inject a little more vibrancy and youthfulness to the city-dwelling Prius. Up front, the Prius C is smartly styled with distinctly shaped headlights that lend it a more aggressive look – well, aggressive for a Prius that is. As you can see, there is definitely a sportier vibe going on here, but we’re not exactly sure how, or if, that will truly draw in younger buyers. Although in all honesty it doesn’t really have to. While the Prius C is certainly a better attempt to blend both the quirky qualities of the Prius with more contemporary styling sensibility, it’s still a Prius, and that already makes it undesirable to many enthusiasts. 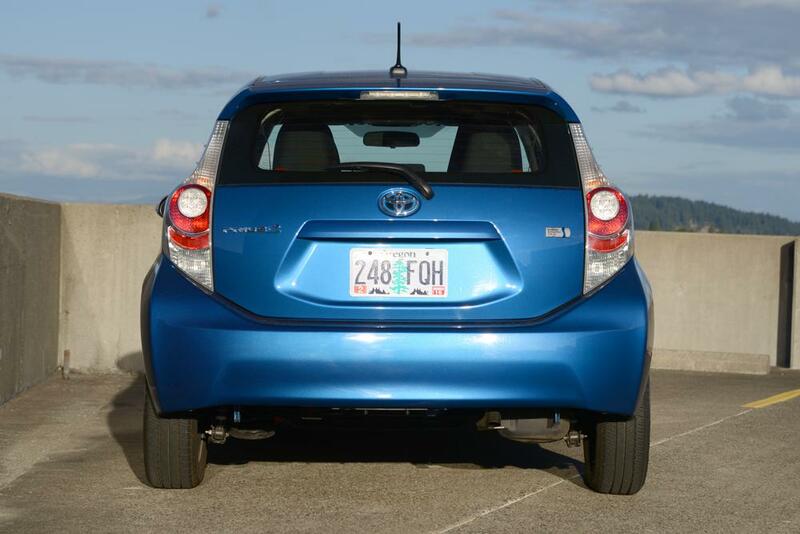 Truthfully, that’s a shame, because we quite like the Prius C’s design. Well, most of it anyways. We could gaze into those eyes all day long, but once we scoped out the side (yawn) and the rear (yuck) we’re just not impressed. The side profile of the hybrid-hatchback is tolerable we suppose, but around back the lifted taillights and jutted rear bumper makes us cry harder than a Meryl Streep movie. Sitting inside the Prius C is, thankfully, a more joyous affair. 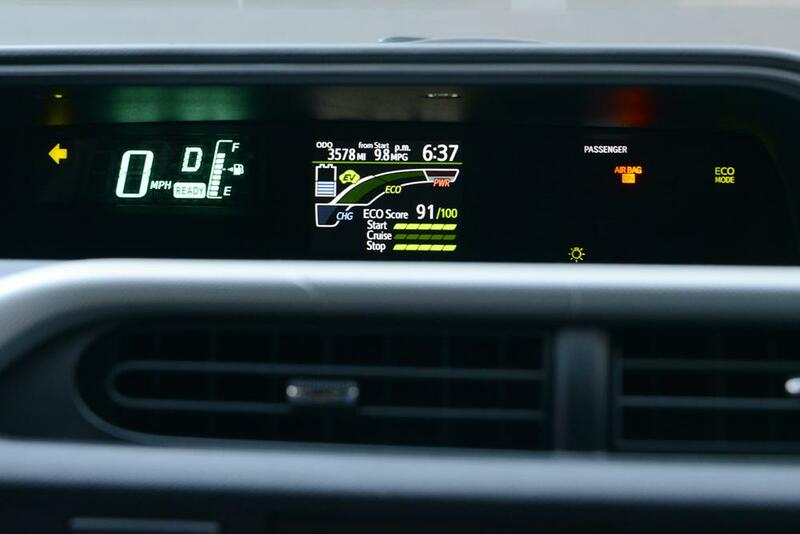 Naturally, the cabin feels ultra-modern with a host of tech features sprawled about, and in true Prius fashion, the traditional analog gauge clusters are replaced by a high-riding digital display placed towards the middle of the dash. While it’s not our favorite arrangement, it’s not unbearable, either. As in the Prius Plug-in, we got used to it after a couple drives. What we did not like, however, is the Prius’ poor material quality. 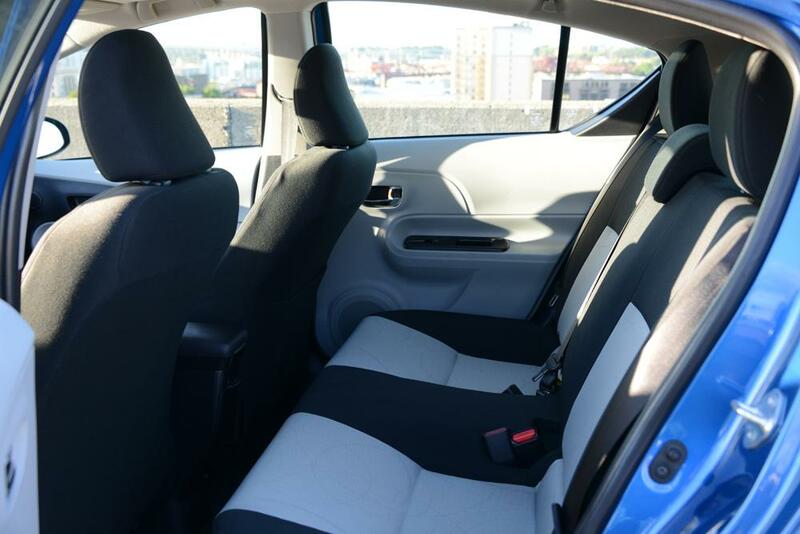 We know the diminutive Prius C is the smallest and cheapest of the bunch, but the grooved plastics inside make it feel cheap, like we’re driving inside a $21,635 Fisher-Price toy. Is it a dealbreaker? Not really, but it is an odd choice, especially when other vehicles in its class, like the Hyundai Accent and Ford Fiesta, sport such nicer materials. 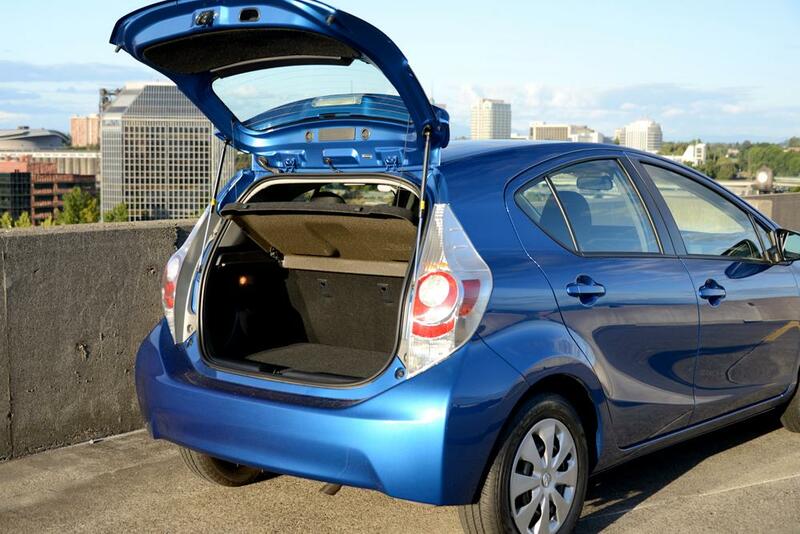 Despite those misgivings, the Prius C skirts the line between spacious and cramped. 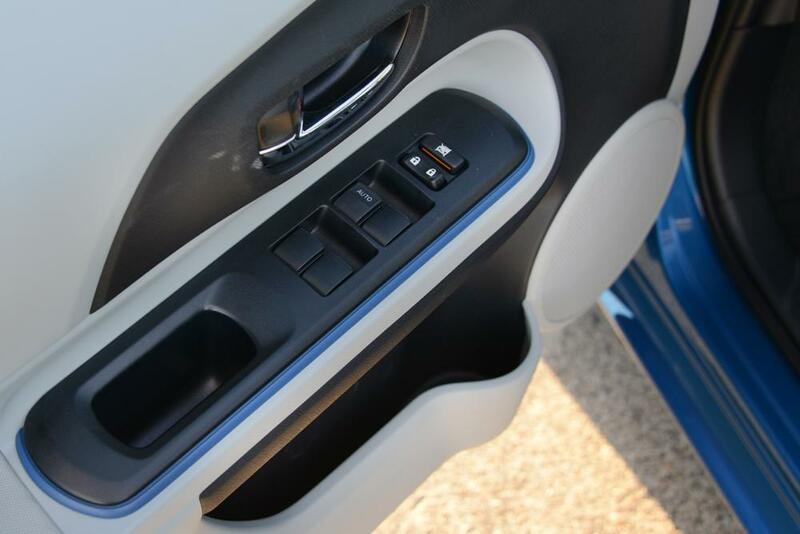 Taller drivers and passengers shouldn’t expect to get too comfortable. But, if like this reviewer, you happen to be slightly vertically challenged, then legroom isn’t much of a concern. Implementing advanced tech features in hybrid cars has become more common than skinny jeans on a hipster, and thankfully — depending on your take anyway — the Prius C has no intention of bucking that trend. As mentioned, our Three trim review unit came well equipped with a wide array of cabin electronics. 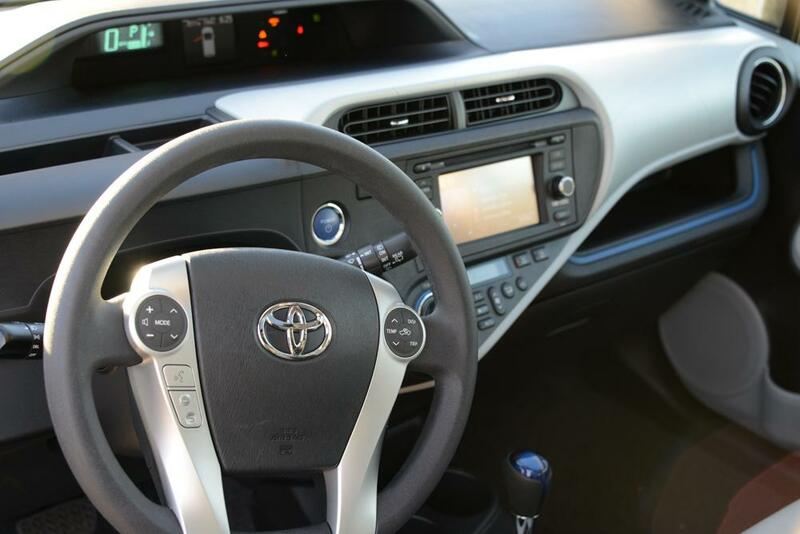 Standard tech features at this trim level included a navigation system, Toyota’s Entune app system, as well as other more commonplace features such as Bluetooth audio/hands-free calling system, and USB charging port. Of course the big tech draw for the Prius (other than it’s fun-sized hybrid engine, which we will get to in a bit) is the Entune system. It acts sort of like a mini smartphone, performing different tasks reserved for dedicated apps like pulling up local weather forecasts, sports scores, stock quotes, and more. Users can also trawl the Web via the integrated Bing search function. Entune even allows you to search for points of interest (POIs) such as gas stations, which show up on the Prius C’s 6.1-inch LCD touchscreen. For Entune to work, we had to download the corresponding Entune app, which is available free in iTunes or the Google Marketplace — we used an iPhone 4S for our tests. We also had to have our phone plugged in to the aforementioned USB port, which is located rather conveniently in a little shelf above the glovebox. This isn’t a problem at all, as the iPhone cord we used was long enough to reach the cup holders. Overall we found that Entune and the Prius C’s tech suite worked great. It’s relatively speedy and easy to navigate, with the LCD touchscreen being pretty responsive. A few problems do exist, however. At night, the LCD screen is bright and vivid, but even a little daylight renders unforgivable glare. We also found that when streaming music from Pandora, or other Internet radio services, album art didn’t always show up. Perhaps more annoying than that, when we would go to change the track manually, it didn’t always show the correct title or track. It’s a minor gripe, but it illustrates the kind of quirks these systems present from time to time. Unlike other telematics systems, Entune runs off your smartphone’s data plan, so be aware that using it excessively could result in data overages. Most users, however, will appreciate the lack of another hefty monthly bill. As for the navigation system, there isn’t much dislike. Route guidance is solid, and better than most we have come across. We liked how easy it is to understand directions, with excellent turn graphics (allowing for 2D and 3D viewing) in addition to audible cues. 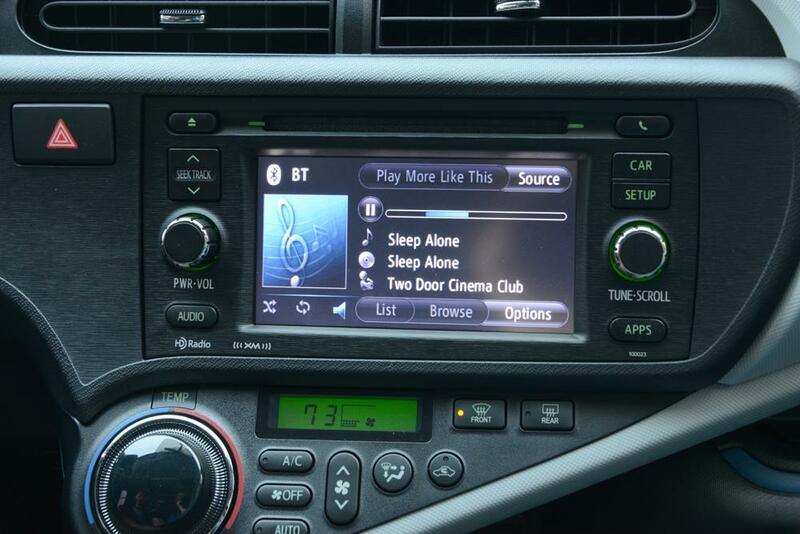 For all its streaming and music capability we were happy to find our Prius C included the Three trim’s upgraded stereo system. Truth be told, we weren’t really expecting much from the smallest member of the Prius family in terms of audio. But as it turns out, the six-speaker sound system in our review model wasn’t half bad, and when operated within its limits (read: at moderate levels) it gets the job done. 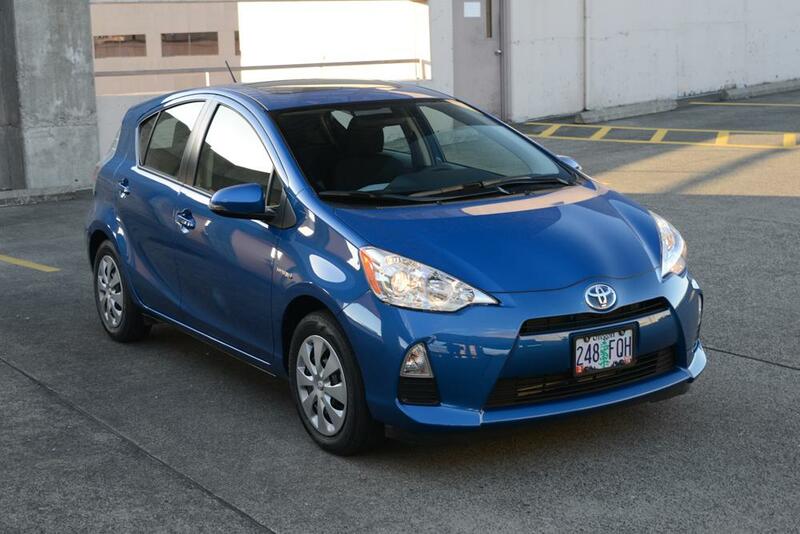 Because the Prius C has been downsized from the larger liftback, so too has the engine. Before Prius fans balk: It’s ostensibly the same as its older and larger sibling’s engine, save for some minor differences. 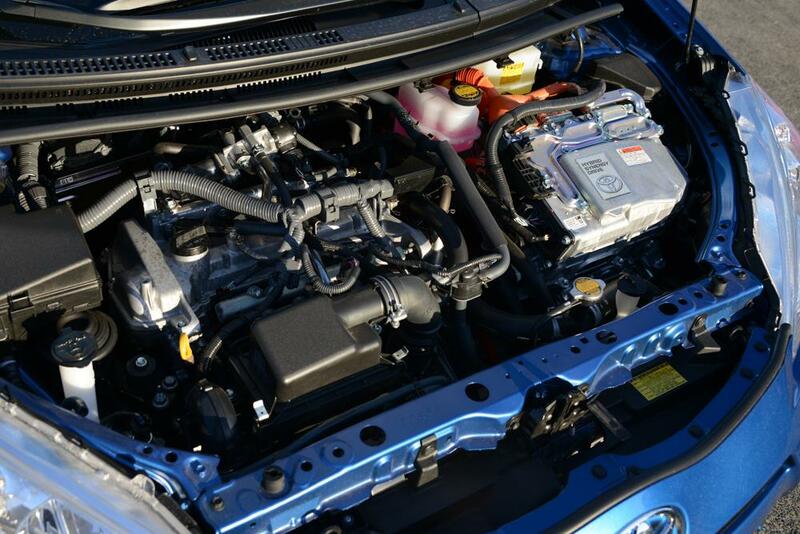 Instead of the standard 1.8-liter inline four-cylinder engine found in the liftback model, the fun-sized Prius’ engine sports a smaller 1.5-liter variety. Horsepower also sees a drop from 134 to 99, while the most important figure, fuel economy, remains impressive with an EPA rating of 53 mpg in the city, 46 mpg on the highway, and 50 mpg combined. 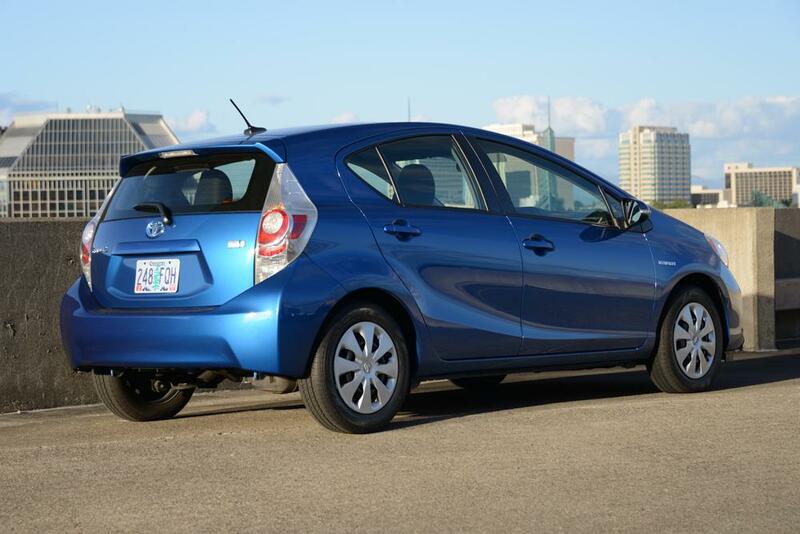 For those seriously considering the Prius C, it’s important to understand that while it is smaller and lighter (about 500 pounds) than the regular Prius, it’s overall fuel economy doesn’t lead the pack by that large a margin. EPA rating for the liftback stands at 51 mpg city, 48 mpg highway, 50 mpg average. Rather than saving at the pump, you’ll mainly save on the up-front cost: the Prius C starts at $19,000, as opposed to $24,000 for the base Prius. While the Prius C won’t be breaking records at Laguna Seca anytime soon, it’s not as dull as you might think. It’s certainly not the spunkiest hybrid out there, but it manages not to embarrass itself too much when given rudimentary tasks like passing cars on the freeway or zipping about town – just be careful going uphill as the C tends to struggle. 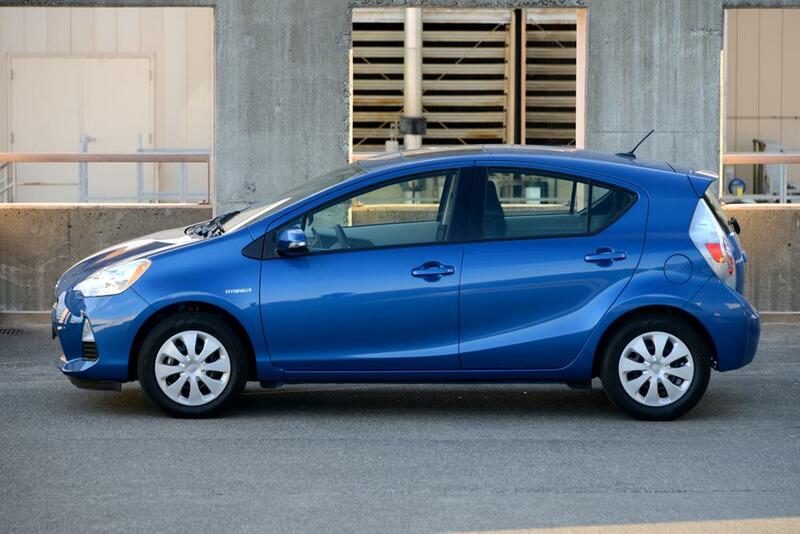 Behind the wheel and on the road the Prius C is both spirited and spritely. Handling dynamics are solid, if not a little unrefined, but it never becomes unmanageable or frustrating. We’re still not huge fans of Toyota’s electric power steering system (too numb for our tastes), but it’s a minor nuisance that goes relatively unnoticed after a while. Given its small and stout stature, the Prius C proudly justifies its “city” moniker by possessing an excellent turning radius and wiggling in and out of tight spots. 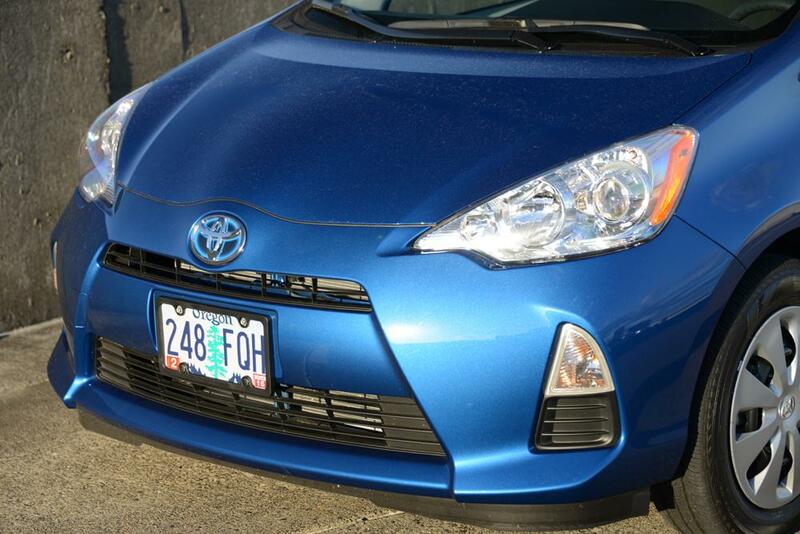 And to be honest, we think it handles better than any other Prius variation. 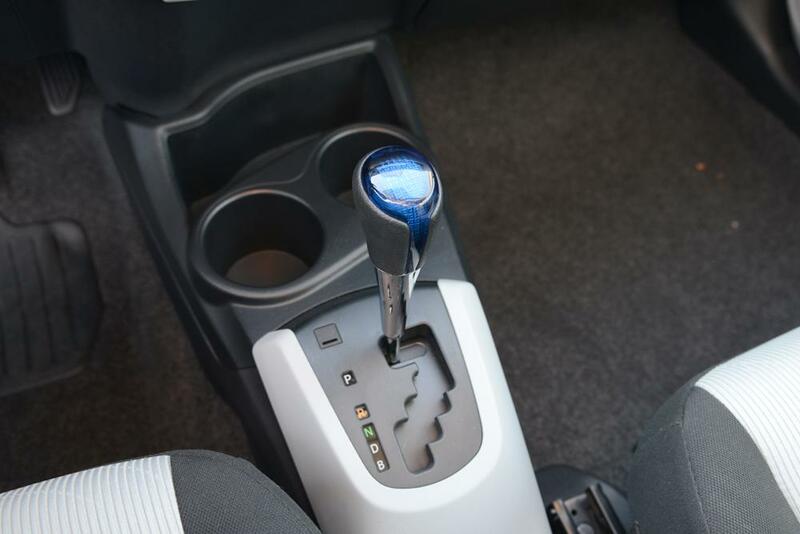 Of course, if there is ever a brief moment where you think the Prius C is anything near sporty, two drive modes are on hand to bring you back from the brink of madness. There is an Eco mode that limits acceleration and helps to achieve better fuel economy, and an EV mode that mines power from the vehicle’s electric motor, allowing you to drive on electricity alone. Truthfully, neither mode is particularly helpful. Eco mode isn’t really necessary from a fuel economy standpoint, but we suppose those who want to wring every drop of gas will find it useful. EV mode, on the other hand, is a fickle beast and far too sensitive. The gasoline engine kicks in when even a feather’s weight of pressure is placed upon the accelerator. More than the drive modes, however, the single greatest feature to help you boost fuel economy is the Prius C’s Eco Score display, which is located to the right of the digital speedometer. In addition to information like average fuel economy, battery level, and battery charging, the Eco Score rates how efficiently you are driving in three different categories: starting, cruising, and stopping, and then gives you a score from 1 to 100. It sounds silly, but we found the Eco score rather addictive. Maybe it’s our human nature to seek approval, maybe it’s because our entire lives we are assigned numbers and letters to quantify our ability, or maybe it’s both. We don’t know. What we do know, however, is that the Eco Score certainly plays off that, and it’s a blast. Even as the smallest of the Prius line, there is a lot to like in the Prius C, starting with its excellent, downsized hybrid powertrain. Anyone shopping around for a Prius is doing so for the miles, and this is an area that the Prius C tackles with aplomb. Consistently averaging more than 50 mpg isn’t particularly difficult, and is greatly aided by the vehicle’s fun Eco Score display. Add to that an excellent array of tech features and nimble drive characteristics, and the Prius C begins to overshadow other hybrids like the Honda Insight, and even its bigger brother, the standard-sized Prius. That’s not to even mention mainstream compacts like the Honda Fit, Chevy Sonic, and Toyota Yaris. 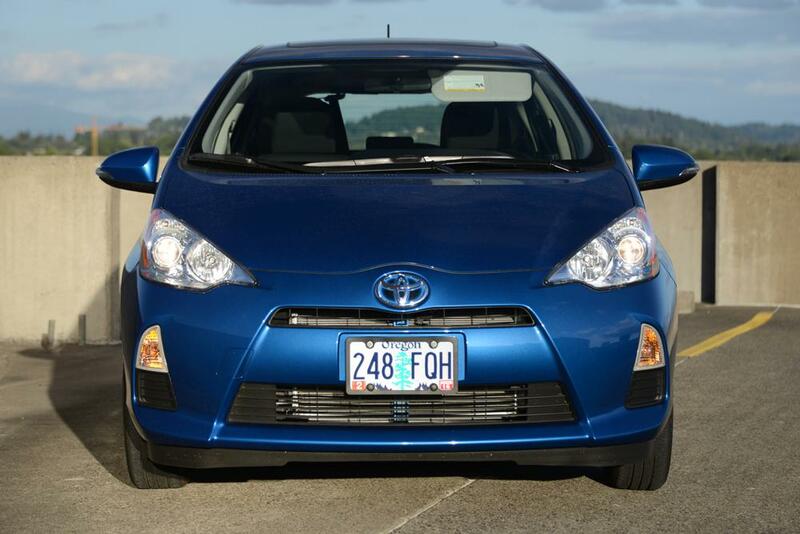 Overall the Prius C is an excellent vehicle, but it isn’t without some faults. While we are impressed with its laundry list of tech features, some aspects don’t work as well as they should. Glare on the nav LCD was a particularly bad issue we found ourselves dealing with, and streaming music through your smartphone via the Bluetooth interface doesn’t always function the way it should. 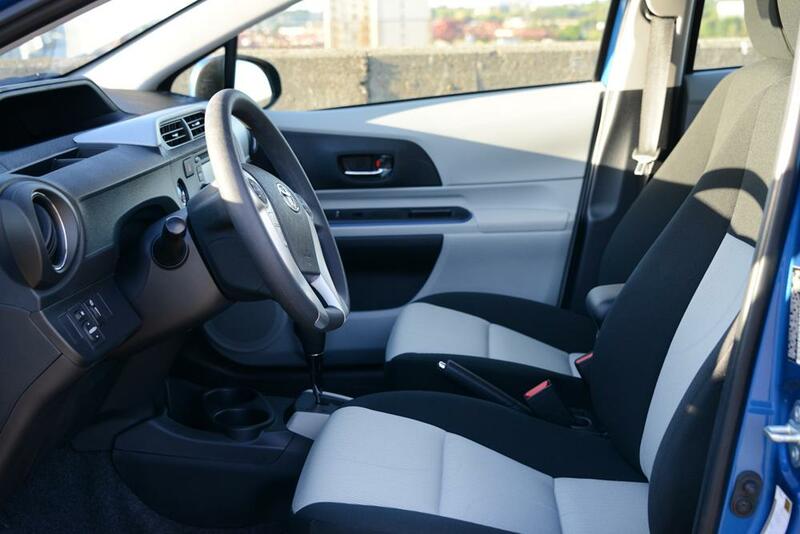 Couple that with the C’s bargain-bin interior materials and the shortcomings of its hyper-sensitive EV mode, and it’s clear the baby Prius has some growing pains it will need to overcome. Did we mention how much we disliked the rear body design? But even after taking all that into account, it isn’t enough to overshadow our overall like for the Prius C. It might be the smallest and youngest member of the Prius family, but unlike each subsequent Baldwin brother, the Prius C manages to outshine its older, more established family members in more ways than one.